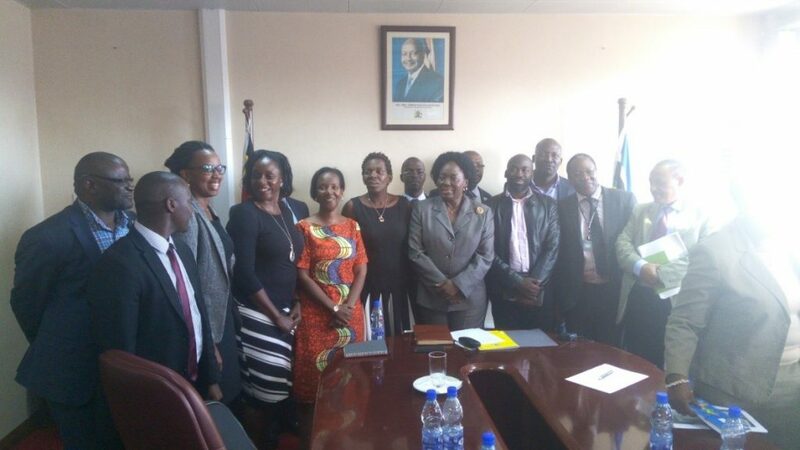 In line with the SPEED’s advocacy agenda on scaling up IRS for malaria control through influencing policy decision makers towards IRS, three SPEED project team members led by the Project Director, Professor Freddie Ssengooba, joined the Malaria Control Program and other key stakeholders for an advocacy visit to the Speaker of the Parliament of Uganda on 7th March 2018. 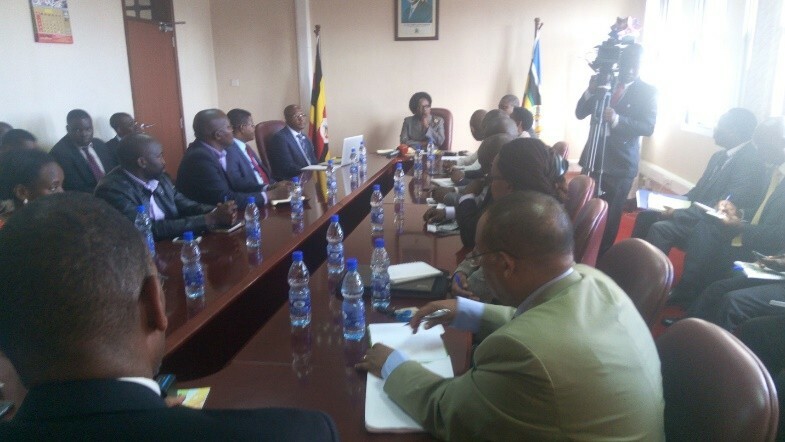 The meeting was organized by Uganda Parliamentary Forum on Malaria (UPFM) and was attended by representatives from USAID, DFID, Malaria Control Program (MCP), WHO and Malaria Consortium. This meeting was a follow up on the earlier stake holder’s coalition meeting that took place on 1st March 2018 at SKYZ hotel. 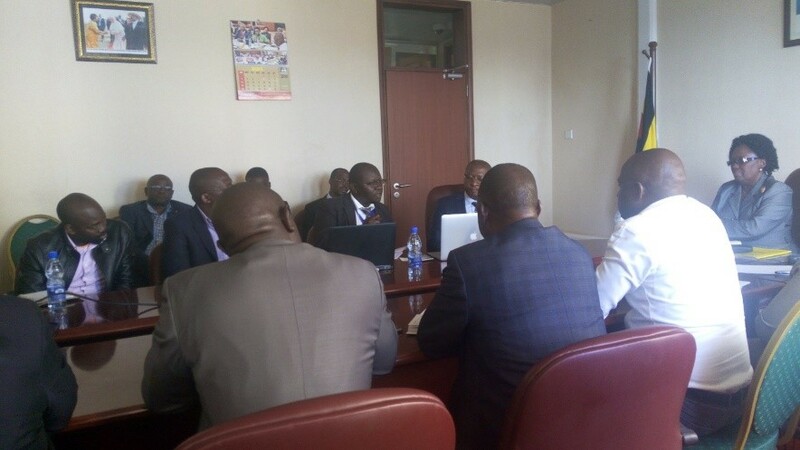 The meeting was organized to share evidence on the status of malaria in the country and how the current interventions have worked and above all to request for the political will of the government to support programmes intended to eradicate malaria in the country. The chairperson of UPFM, Hon Balyeku Moses appreciated the Speaker of Parliament, Honourable Rebecca Kadaga for the opportunity she accorded the team to discuss with her the important matter of malaria in Uganda. In his presentation, Mr Peter Mbabazi (Finance and Multi-several Collaboration expert at MCP, Ministry of Health) showed- with statistical evidence- that malaria is the Number 1 killer infectious disease, accounting for 40% of visits to Outpatient Department. He added that in 2017 alone, more than 9.46 million malaria cases were confirmed in various health facilities, and sadly 5,111 deaths reported were as a result of malaria. He also affirmed that the progress made from 2009 to 2014 on reducing malaria prevalence from 49% to 19% has stagnated in recent years (2014 – 2017). He pointed out the northern region as the main contributor to Uganda’s malaria burden during the 2014-2016 period after indoor residual spraying (IRS) was abruptly halted. 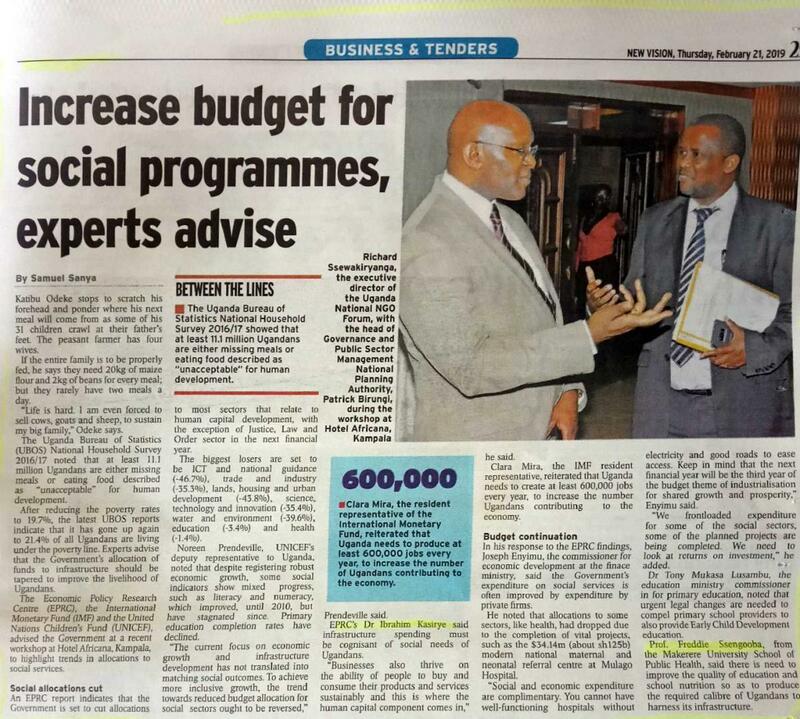 This reechoed the voices of stakeholders from the same region who proposed for the scaling up of IRS in all parts of the country following the good testimonies that were received based on the SPEED’s consultative meeting held in Gulu on 9th November 2017 to ascertain the impact of IRS on malaria reduction after IRS had been implemented. Further, he explained to members the progress Uganda has made in the fight against malaria at a global level. For instance, he cited WHO 2017 World Malaria Report, indicating that in 2016, Uganda was ranked 9th and 10th among the highest contributors of malaria cases (morbidity) and deaths (mortality) to the global burden of disease, respectively. Mr Mbabazi noted that government funding to the National Malaria Control Programme of only 5% of the total budget and 95% come from development partners; The Global Fund to Fight AIDS, TB and Malaria, UKAID (DFID), and Presidential Malaria Initiative (of US government) among others, casts doubt on the sustainability of the interventions. The presenter still hinted at the upcoming CHOGM 2018 meeting scheduled on 21st March 2018 in London at which malaria is among the issues that will be discussed. At this meeting, all Heads of CHOGM member states will be required to commit their countries to the reduction of malaria. The government should take lead in mobilizing the entire population into mass action against malaria. Advocate and engage the high-level political leadership to for political will to eradicating malaria. He asked the Speaker of Parliament to secure engagement of His Excellency, President Yoweri Museveni, as a strategy of sustainable political commitment to malaria-free Uganda by 2030, just as he did with HIV/AIDs. Persuade the president through his jurisdictions, to: a) make a public declaration on malaria as number 1 public health enemy and commit to “Malaria-Free Uganda by 2030”; b) own and accept to become the Life Patron of the Mass Action Against Malaria movement; c) personally launch the Mass Action Against Malaria initiative on 05th April 2018 in commemoration of the World Malaria Day 2018, and to d) include the Mass Action Against Malaria initiative as an agenda for discussion at the upcoming Commonwealth Heads of Government Meeting (CHOGM) in London, United Kingdom, April 2018. Increase domestic funding for malaria to at least 285.6 million USD towards accelerated implementation of the UMRSP for 2018-2020 and establishment of Malaria Trust Fund. Advocate for the increased profile of malaria response and Legislative Actions on malaria e.g. 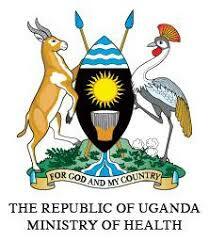 Enactment of Uganda Malaria Act and revision of the Public Health Act. In her reaction, the Speaker of Parliament Hon. Rebecca Kadaga appreciated the team for coming up with MAAM initiative which is tackling a critical issue affecting all Ugandans. She raised concern over the fact that malaria has been increasing yet there is mass distribution of mosquito nets. She asked for clarification on how long the chemicals used in indoor residual spraying last. In his response, Dr Jimmy Opigo- the Manager, National Malaria Control Program (NMCP) highlighted the benefits and challenges of several IRS chemicals and for how long they remain effective when used. He emphasised that combination of malaria control efforts is the best strategy to control malaria. 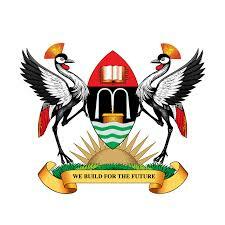 He emphasised the role of Makerere University School of Public Health in leading the process of evidence-generation on cheaper models to scale up IRS as a key strategy in eliminating malaria in the country. Dr. Jimmy Opigo( with a black laptop) presenting about different chemicals used in mosquito nets and IRS noting efforts by Makerere School of Public health under SPEED to generate evidence on cheaper IRS models. SPEED Director, Prof. Freddie Ssengooba (2nd right, with a tag), Dr Aloysius Ssennyonjo behind the speaker and Mr Richard Ssempala (in a red tie) and other stakeholders posing for a group photo with the speaker.